Since forming a little over three years ago, there are few corners of Canada that Peterborough, Ont. 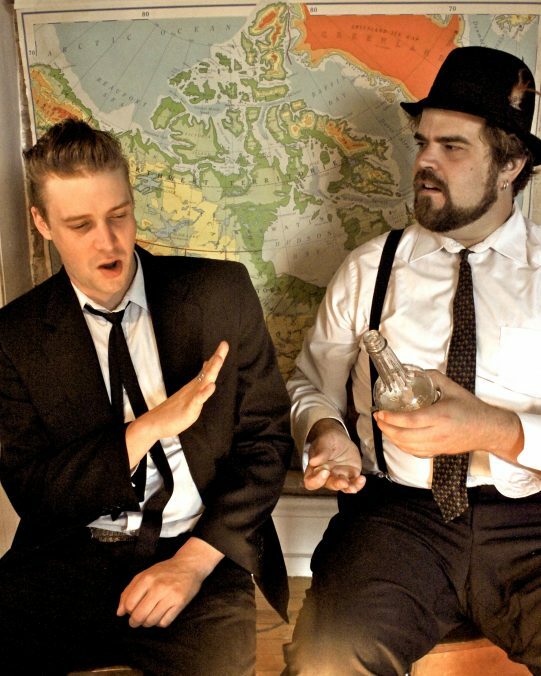 folk-grit duo The Mayhemingways haven’t explored. Case in point, prior to arriving in Moncton for their show at Parkindale Hall on Saturday, the group – comprised of multi-instrumentalist Benj Rowland and drummer Josh Fewings – will have performed more than 15 shows in Atlantic Canada alone. While the bulk of bands that tour Atlantic Canada tend to only hit the major centres of the region, The Mayhemingways are unintentionally putting those bands to shame, playing off-the-beaten path locales including Woody Point, Newfoundland, Mount Stewart, P.E.I. and a collection of house concerts along the way. For a band that is seemingly always on tour somewhere across the country, Rowland is unable to pinpoint a precise number on the amount of shows the band has undertaken over the course of their career. Originally conceived as a quartet, The Mayhemingways’ line-up was reduced to just two members fairly early in the game. Although he and Fewings were initially unsure how the duo format would pan out, Rowland says the reality of their desire to actively tour is ultimately left few other choices on the table. “We were initially looking to be more of a traditional band in terms of membership numbers, but the reality of touring and playing shows dictated otherwise. Musically, we’ve found that it has actually opened up a number of musical possibilities, including relying on live improvisation, that we might not have been able to explore as a part of a more traditional group,” Rowland offers. In a revelation that will surprise few, The Mayhemingways most recent studio effort, Hunter St. Blues, came to life while the band was on tour. Recorded in Edmonton over the span of six days with Jr. Gone Wild guitarist Steve Loree, Rowland shares some of the material that found its way onto the record is a combination of some of the group’s earliest and more recently penned tracks. Asked if the group harboured any concern about how material from the two different eras of would gel together in the context of a single record, Rowland says there is a common thread running through all of the material on Hunter St. Blues. When: Saturday June 11, 8 p.m.